Love That Max : Helping kids with special needs fit in: How much do you reveal? Helping kids with special needs fit in: How much do you reveal? Max is going to try out Cub Scouts. This week I spoke with the Boy Scouts leader in our area, Chris, and we'll be attending the next Cub Scouts meeting. Max will be in the Bear Den, a group with maybe 8 kids who are all his age. I like that it's small. "We also have monthly meetings where all the dens come," Chris said. "Max is not really into loud noises and crowds," I said. "So we might not be at those." Chris and I spoke about Max's CP. At first, I'd wondered whether I should mention it, or just let Max show up at a meeting. But, I told him. I've learned that it's better to say something and feel things out ahead of time, make sure there is an open-minded attitude. I figured the Boy Scouts, of all groups, would be inviting. Chris was. I asked him if they'd ever had other kids with disabilities in Cub Scout troops in our area. He mentioned there had been some boys with ADD. Max's challenges are totally different, but we'll see how it goes. It's the first inclusionary organized activity Max will be participating in, something that's been on my mind since camp this summer. Dave and I sat out on our deck and had dinner later that night, after my conversation with Chris. I want Dave to be the one to go with Max to the meetings. We don't really have any Daddy-son activities in our life right now. I think it'll be good for both of them. Dave told me that when he was a kid, his Cub scout den had a boy with CP in it. Usually Mr. Positive, Dave looked kind of morose. "This kid didn't really do much, he just sort of hung out as we did stuff like crafts and learning how to use a knife," he said. I put my fork down and looked at him. "Honey, you'll be there with Max, you will be able to help him," I said. "I hope so," Dave said. Meanwhile, this is what I'm wondering: Should the den leader let the other cub scouts know ahead of time that Max has special needs? Or should Dave and Max just show up? I'm leaning toward just showing up. My son has Down syndrome and he's a Tiger scout this year. His brother is a bear and my husband is the den leader for the bears. Hubs also goes with our Tiger scout to each of his meetings. It is a challenge. We keep reminding ourselves that the motto is 'do your best'. Not someone else's best. Just yours. I went to the last den meeting because my hubs was out of town. It was definitely a challenge but it worked. My son probably won't go camping this year but he'll be able to do the 'go see its' and do the meetings. He probably WON'T do the over night at space camp. He did not do the baseball game because he hates heights and they were in the nose bleed section. But police station visits and things like that will be fine. We'll give it a try and see how it goes this year. All you can do is try. Like anything else, somethings work and some don't. Good luck. I hope this one works for you! Just show up. Kids can be nice. We started cub scouts 5 years ago. Now my son is in his 2nd year of Boy Scouts. It has been a lot of work. There have been struggles. I have cried in private. But he has made a group of friends. He brings kids together. He has grown. I nearly lost it at a recent Eagle ceremony when the Eagle Scout gave his spirit of scouting candle to my son who is in turn going to give it to someone at his Eagle ceremony. You are brave to be trying this. It is great to have dad/son things. The reception you got from the Den leader is a great starting point. Just show up. Be very involved and help in any way you can. It will hopefully be worth it. Max will have fun. Don't worry about the Pack meetings. Maybe when they do advancements, they can do a ceremony for Max at the Den meeting. Good luck. Go team Max! Victorinox does a great kiddie penknife (http://www.victorinox.com/content/search?searchterm=Kinder) that might work for Max. We gave it to a boy Max's age who's got Downs and he was over the moon. I really think it depends on what you child's particular issues are, but we have sent Mack to camp and other activities without a big intro. I hesitate with that sometimes because his issues are not as obvious as Max's may be . But Mack can speak for himself and knows why he is the way he is and has no problem explaining it. My worry is that unless we say otherwise, he won't be allowed to participate fully because they're afraid he'll get hurt. Our policy is that he takes the lead and does what he wants to do. Overall, I'd say go with your gut. I think just show up as well. Max is certainly at an age where kids start to notice differences, but I'm not sure it's necessary to make it an issue. I just discussed this with my son's teachers because he joined an inclusion preschool class this year. They all advised that they would handle questions as they came up, but there was no need to point out differences. Although it's hard, requires courage, and is sometimes soul-destroying, I think that forcing ourselves to help our kids participate like this gives other kids and their parents an opportunity to be exposed to and discuss all kids of different abilities. And yes, this assumes that all parents are prepared to have a positive conversation, but I can't bring myself to think anything else. Good luck...picture of Max in his uniform please? I say just show up. You have already given the Den leader a heads up. If you make it a big deal with the entire Den then it becomes a big deal. Let the interactions be organic. My Aspie daughter has been in Girl Scouts for 6 years. Either her MT or myself have attended every meeting with her, even though she is now pretty independant. I think it is helpful to a leader trying to reign in several children that they do not have to have the extra worries of a special needs child. My being at the meetings also helped our daughter push the limits or her expectations. Overall, it has been a truly rewarding experience. I wish the same for Max & your husband. All I know about this is that in my program, there was a guy with pretty severe MD who had been an eagle scout - YAY! And yay for you guys, trying it out! E is in Daisy Scouts. The leader is a friend of mine, so I wasn't worried about the leader freaking out. The other girls, well...I wasn't so sure. Our first meeting (where I was showing the leaders how to put on/off E's AFOs) was pretty terrible...I had asked the leaders to meet with me after all the girls had left, which we agreed. ALL the girls came back in while we were mid-AFO-lesson, and questions started pouring in "What's wrong with her? Is she sick? What are those? Is she retarded?" and my heart broke. E's eyes bugged out. It was really awful. Here's the good news. The troop is WONDERFUL. Elena loves it. That first day, there was a lot of excitement and too many questions (turned into a Question Avalanche)--and even though a lot of those questions went unanswered, the girls were fine. E's grown a lot with these girls, and I really thank our troop leader for that. I found out last year that one of the Daisy Dads even has CP! I hope you all find a good fit for Max! I think you are leaning the right way... no defining him by his 'diff-ability' that way... at least that's what we hope, as mom's, right? The bigger deal you make out of it the weirder it's going to be for everyone. I would say just let Max and Dave go to the meeting. The Den leader is up to speed and Dave is going to be there. The boys in the Den may have questions but they will probably just welcome Max into the Den and move on with the planned activities. Both our boys are in Scouts and our daughter is in Daisy Scouts. My husband is currently a Den Leader and an Assistant Scout Leader. His den has a sweet boy with autism. Before he joined my husband's Den he had already been in the Pack so the boys knew of him. Before the first meeting my husband asked the Mom if she had information that he could review so that he could help handle any questions the boys might have. He had a basic knowledge of autism at that point but he wanted to make sure he wasn't going to say something that was factually inaccurate. The information she provided was fantastic. The boys in the Den understand that sometimes this little boy needs extra attention or help and they are always willing to provide it. My husband is an Eagle Scout so he really wanted the boys to be in Scouting. He goes on every trip and every summer camp with them. As he has pointed out, it makes everyone's life easier if he is there. He understands their issues and he can address them (ie administer medication, talk to the medical staff about physical limitations, etc.). As a Cub Scout Alex's back issues required a few work arounds but it was all taken in stride. All three of our kids have sensory issues and loud noises can be problematic. The noise levels at the Pack meetings do get loud but Pack meetings are not usually required. The Pack does have a special Pack Meeting each year that focuses on inclusion and awareness of special needs. This Pack meeting tends to be more organized and a little less loud. The kids learn about so many things at this meeting because everyone is invited to make posters, set up stations and present on different needs. Our Daisy troop has a couple of girls with health issues and we simply tell the Moms that the Service Unit events are optional and not to worry about attending. We even have the girls in attendance trade swaps for the girls who can't make it. All of the girls were great about Victoria's brain surgery. We have had issues but overall Scouting has been a very positive experience. I hope Max's experience will be just as positive. I would give them the heads up. Maybe they can then adapt some of the activities for Max. Olivia has been in Girl Scouts for a year now and it's been really good for her. She doesn't really do many of the activities for badges, and I stay with her at the meetings, but for social skills? It's been awesome. I don't think the kids need to be told before you bring Max - I went to Rainbows and Brownies and I loved it (I have congenital muscular dystrophy and use a wheelchair). Yes, I couldn't do all of the activities, but I was immediately accepted by the other children. I'd say just to be prepared for questions, as I'm sure you are already, but I think you'll (hopefully) be pleasantly surprised with how the other kids take to him. No advice, but hoping Addi will do Girl Scouts next year in K. I do love me some cookies! Hope it goes well...let us know! Yay for Dad stuff, too. 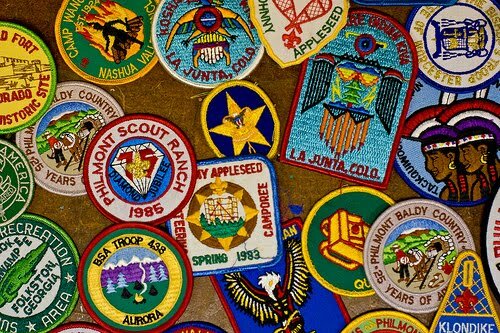 My son has High Functioning Autism, and he's in his 3rd year of Cub Scouts. The leaders have all been AWESOME! The only kid to be rude to my son is the boy with Asperger's. Last week he said, "That kid looks stupid when he shakes his hands around. Make him stop it!" and that is because he says whatever pops into his head, so I try to let it go. The big pack meetings used to be WAY TOO MUCH for my son, but this year he has been okay so far, but sometimes we still stand in the hall and listen from a distance when it gets too loud or busy in the main room. Overall Scouts has been a great experience for my son. I hope it is for Max, too! I'd say just be flexible and let Dave run with this one. He's probably a bit morose because his childhood experience probably involved some of the scouts not being nice to the kid with CP in his pack, and he doesn't want to say too much because he doesn't want to get you upset. People are more aware now, though, so I would be hopeful for a better experience. You don't have to do everything, you know. Max will let you know if he likes it. Dave will let you know if it is "working" or it's too much of a strain to keep at it. Don't be a sucker and buy all the uniform stuff until you know he's going to stick with it--that stuff is expensive. 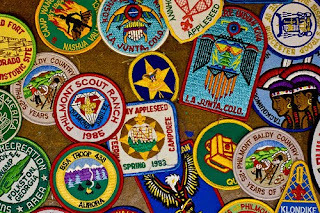 Scouting wouldn't be a good fit for my kids (unless it was Girl Scouts for my youngest, he'd LOVE that, but they wouldn't take him!) but they get the whole outdoorsy thing from their grampa, who teaches them about nature on every camping vacation we take. Also, the Boy Scouts organization does not care for gay people, and my son is probably on that trajectory once he hits puberty, so they would probably tease him or refuse to let him in, especially given some of his unique clothing choices. They each have a few friends now, they visit back and forth, so life is good and they manage to stay amused around the house/barn without joining any national club with pricey dues. That's fine with me. I do hope Max has a good experience, but if he doesn't, don't sweat it. At least you tried. pack knows what is going Max will be fine. To he will have dad there to help him and answer questions. has special needs and I wouldn't change a thing. We have 2 in scouts they are 11 and 9. We let the den leader i believe that what he called. he is in charge of all the boys. We let him know that our youngest has problems he told us not to worry about it he do just fine. Both the boys have been going for the last 2 years. The oldest one goes on all the camping trips and ever thing. Our youngest one we haven't sent on the camping trip because we can't even get him to sleep at his uncles. there my be another day they go to. They all attend the pack group its a must. Plus once a week they go to the school and raise the flag and lower it and fold it up. Both the boys really enjoy scouts. All so I think if you don't call ATTENTION to Max he will be fine. I might say something to the leader but I wouldn't to the other kids. That might make it in to much more of a production than it actually is. As a Scout leader, and the Mom of a special needs kid, please, please, please tell all of the leaders. Not "my kid has ___________", but "my kid has _________________. Here are some of the strategies that work". Max will get more out of the Scouting experience if everyone is aware of his challenges and how to have him cope. We are trained to adjust the meetings to the needs of the youth, but can't do that if we are unaware of the needs. Even simple things such as chosing purple paper or cooking pasta at a camp can be adapted if the leaders know that it will benefit one of the youth in their care. In Canada, there is a disability awareness badge. The youth would probably be thrilled to get a badge while learning about CP. This way, the youth could be informed about Max without making Max a spectacle. I think letting the leader know was the right thing. This gives the adults a chance to prepare for any questions. As you say, Dave will also be there to field questions. It is really, really awesome to hear about all of the kids who are Scouts. The next meeting is late October. I'm going to find some pictures online of cub scouts and show Max, and start talking about the new kids he'll meet. One of the main things I'm hoping he gets out of this is the experience of hanging with kids who do not have disabilities. And yes, Kristin, I'll be talking with the den leader about strategies that'll make Max comfortable. And ask him not to say anything to the boys before Max shows up. Jan: "Do your best, not someone else's best" is a great motto for all kids to live by. Adults, too! Ellen, I'd say just show up. There may be a few innocent questions. After 4 years, it's gotten easier. My son is 6 months older, and now a Webelo (one year ahead of Max). You can google Bear Cub requirements and find out what the "skills" needed are for earning the rank. (And there ARE modifications to the whittling chip (safe use of pocket knives) There are even religious awards that can be earned. And there is flexibility throughout. If he sticks with it, my son would be honored to give Max his bear cub hat, neckerchief and slide. (The shirt stays the same but the colors change through the ranks. Tigers (1st gr) are orange, Wolves (2nd gr) are yellow, Bears (3rd gr) are lt blue, and Webelos (4th & 5th gr) are plaid. Some times as mother we are so used to being advocates for our children. we just do it with out thinking . this is a good opportunity to see how max will advocate for himself let him do it . let him define himself to the others. you have written allot about the word retard lately while i understand your distaste for it and why. it is after all just a word . i dont define my child as retard nor do i allow him to define himself that way. us setting the definition of what are children may or may not be then defining them for the world might be a good thing might not. i think it depends on the situation. I also think it would be hot to see how max defines himself when asked. perhaps it will be something totally unexpected. but the sooner he learns to define and be him self the stronger advocate he will be for him self. I found at cub camp it was easier to understand how to help the scout if the parents were upfront in telling me any special needs their child had. Due to HIPPA Regulations, even though you filled in the health form, the leader may not be aware of non obvious challenges. If you are not staying with your scout and you are entrusting them to a leaders care, please, communicate! (My son has physical limitations due to back surgeries and had to wear a body brace.) This way his leaders knew what he could or could not participate in and could adapt for him if necessary.